Sensational news came from Qatar: Vladimir Kramnik will play in Qatar Masters Open which is scheduled to take place from November 25 to December 5 this year. This has been announced on the Facebook page of the competition, in addition the grandmaster confirmed the information to us. 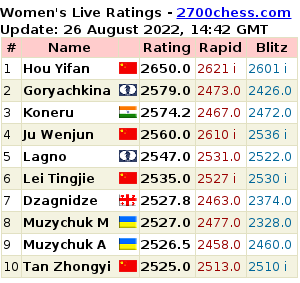 The world's leading GMs rarely play in Opens. Ivanchuk and Svidler are just a few from those regularly visiting Gibraltar Open. Other famous GMs also participating in Open tournaments are Kamsky, Adams and Mamedyarov. By the way, now Azerbaijani is second in the participants' list at Qatar Masters. Some time ago after an unsuccessful performance at Baku Open Mamedyarov shared his impressions on playing in opens in the interview to chess-News: "Now everyone knows ho to play chess. That's because today's chess is available in computers, so everyone watches and as a result starts playing well. One has to do something to win a game, simply winning is not possible... Perhaps, I start to understand those with 2700, 2750 rating who avoid playing in Opens..."
Ruslan Ponomariov on the other hand doesn't play in Opens at all, "All formats are comfortable to play except Swiss. The field there is too mixed. You may be paired to very weak players in the first three rounds, which is not thrilling at all...", he said in the interview to our website. 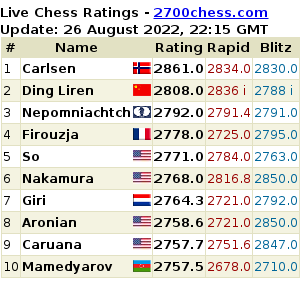 Evgeny Sveshnikov, also interviewed by us some time ago noted, "In Opens you play against the rivals who on the paper have 2500 ELO points, but in reality might be playing as the one with 2700 rating. So, if in a round-robin the opponent plays in accordance to his rating, in Open, if you are trying to gain some ELO points (and how to do this is a topical question for a lot of players) you play against the player who doesn't play in accordance to the rating attached to him, but against someone who virtually has 100 or 200 more points. Such problem exists, but I don't see the mathematical ways to solve it." It is really hard to recall when Kramnik played in the Swiss format competition last. Last year he finished first the World cup with 128 participants. The process of attracting top players to Qatar Masters reached its culmination: this year's highlight participant will be Magnus Carlsen himself.